What is Maximal Power Available? Maximal Power Available (MPA™) is a measurement of the maximal power that can be produced by an athlete for a given exercise, factoring in fatigue. Simply, MPA establishes at every given instant, how much power you have. It is a concept that is well understood by sport scientists and coaches as it establishes the upper limits for activities like running, swimming, cycling, rowing, etc. In the simplest of terms, it is the limit of athletic performance for a given activity, at a given time. MPA forms the foundation of performance and training, albeit indirectly at the moment since as of today, there have been no convenient ways to measure it. Interval training, for example, can be thought of as exercise that reduces and recovers MPA over a series of repetitions. Coaches will prescribe high-intensity interval workouts with specific intensity, durations and recovery periods to use as part of a training plan. Knowing what workouts are suitable for the athlete that will enable them to achieve their training goals has been considered part of the art of coaching as it requires experience and a deep understanding of the athlete in order to do well. By determining MPA during bouts of exercise where fatigue has been accumulated, a new way of viewing performance and training is introduced. It provides coaches and athletes with direct feedback on the how close the athlete is to their limit. This provides numerous benefits as will be explored here. In our last blog , we explored the relationship of power-duration and how one’s fitness signature is represented by a power-duration curve. Each point on the curve represents a point-of-failure, i.e. an inability to output the target power by the athlete due to fatigue. At precisely the point-of-failure, the target power becomes the athlete’s MPA and any power output beyond this duration is below MPA, by definition of the power-duration curve. In order to return to being able to output the target power, the athlete requires recovery. During a steady-state, fixed power effort above threshold, from fresh to failure, an athlete starts with an MPA that is peak power and MPA reduces to eventually become equal to the fixed power value. MPA represents their limit at any given moment and at the point of failure, their power equals their limit. Thus a point of failure can also be viewed as a point of maximal effort. The duration at a given point in time to the point of failure, is often called time-to-exhaustion (TTE) and it represents the time it will take the athlete to reach failure. (Note that the use of the word exhaustion may cause confusion with efforts of short duration since failure will be achieved before the feeling of exhaustion. Exhaustion in this context means failure to produce the target wattage). The affect on MPA is a function of the total amount of energy consumed. (It is also a function of cadence and this will be explored in a future blog. For the moment, we’ll assume that cadence is optimal during the effort). As the athlete fatigues, MPA reduces. As the athlete rests, MPA rises. At any point in time, MPA can be determined. 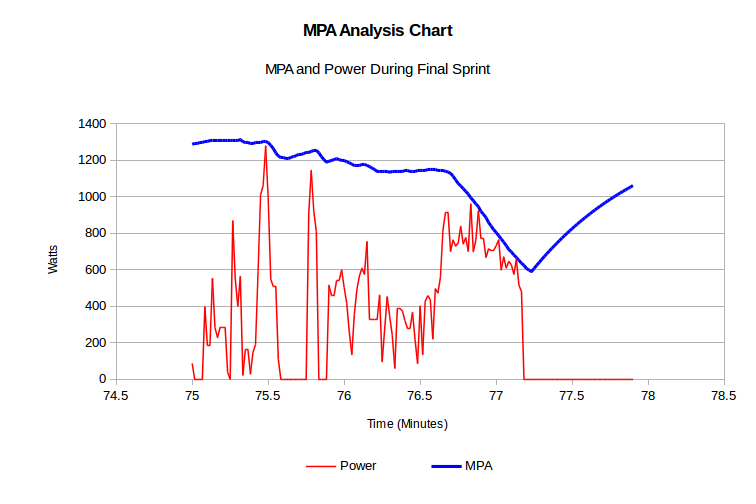 Plotting MPA and power vs. time, we can compare power output with MPA to see how the athlete is performing relative to their MPA: We can now visualize the affect on MPA due to accumulated fatigue and recovery. We can also compare power output with MPA at a given moment. When MPA equals the athlete’s power output, we have a point of maximal effort / point-of-failure, by definition. Also similarly, if the power output crosses the MPA line, the athlete’s signature used to derive the MPA is too low and the athlete has achieved a fitness breakthrough. 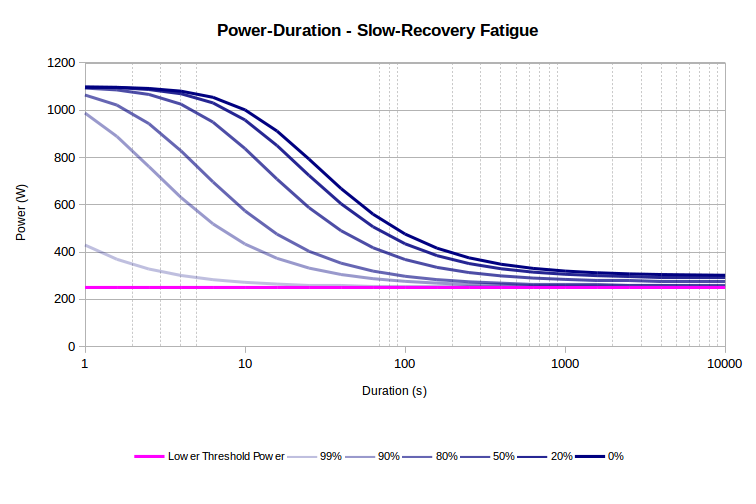 An an athlete’s power-duration curve provides a representation of steady-state, fixed power, fresh-to-failure efforts where MPA reduces from peak power to the fixed power. 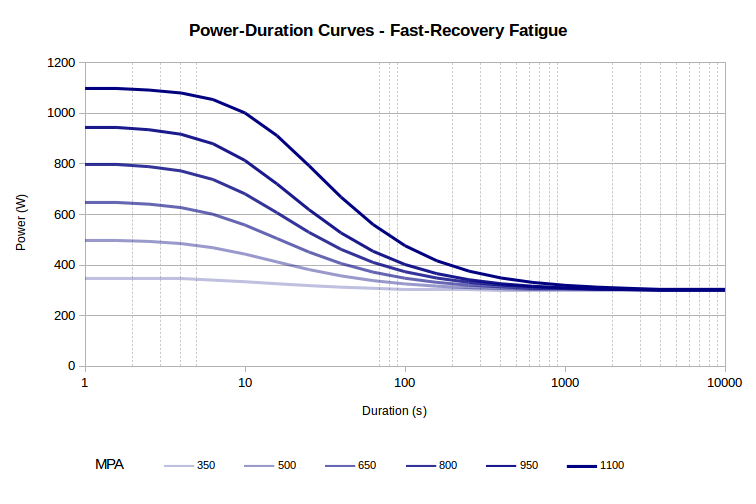 When partially fatigued, a intermittent power-duration curve can be determined from MPA since it represents the athlete’s fatigue-adjusted peak power at that given instant: These intermittent curves show the power-duration of an athlete in a fatigued state. 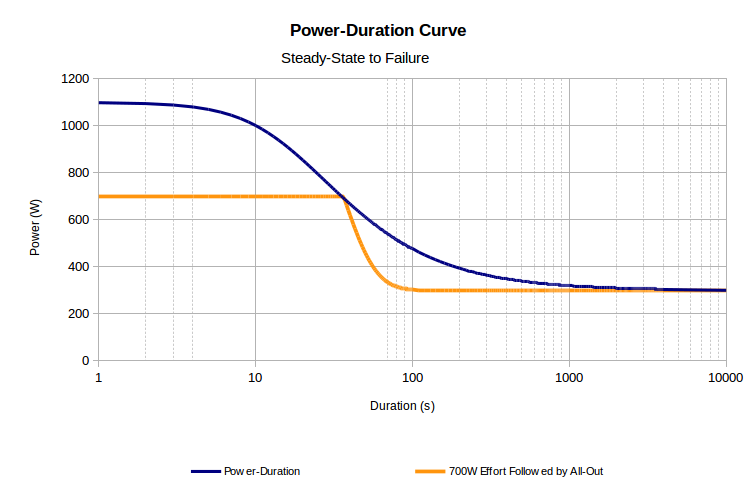 One can consider these as fatigue-adjusted power-duration curves. What this means is that we can not only determine an athlete’s MPA at a given moment but also establish their TTE for any given power output above threshold from the partially-fatigued state. Similarly, we are also able establish the highest power that the athlete can sustain for a given duration while in a fatigued state. We’ll explore these concepts in a future blog on real-time applications of MPA. When the athlete recovers and MPA rises, the time to recover can be determined. Generally this means full recovery, but importantly, the time to recover to a reach a given target MPA can also be determined. Establishing the target MPA recovery duration is a key component of workout design and we’ll be covering this topic in our next blog: Training Applications and MPA. Exposes potential PED use, where fitness breakthroughs that are outliers may suggest potential infractions. The athlete may have never had points of maximal effort. Many rides, particularly lower intensity or recreational rides, do not have the athlete ever reaching a point-of-failure. These activities will not provide an accurate measure of an athlete’s fitness signature at the time of the activity even though one may obtain it from the data. When a fitness breakthrough is achieved, it generally means that the athlete’s signature can be adjusted upwards such that training workout targets and MPA analysis will now use the updated signature. 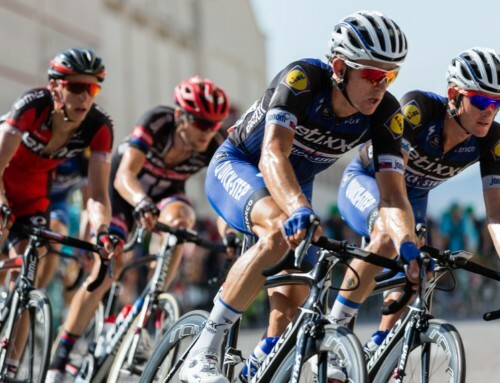 Providing feedback on fitness gains and breakthroughs is a great motivator and one could argue that, outside of competitive athletic pursuit, is the main reason why recreational cyclists track and manage their performance data. Athletes no longer need to perform specific fresh-to-failure tests, sometimes multiple tests, to determine their fitness. 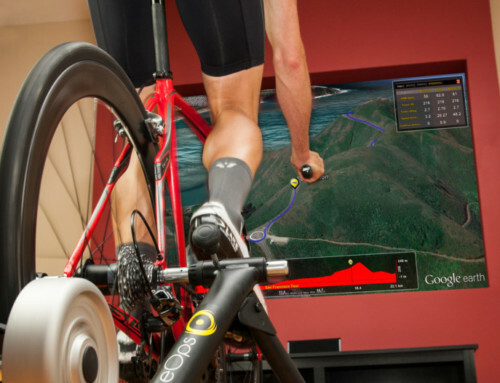 Measuring fitness from races, rides or workouts enables faster feedback on progress. Detraining and fitness losses can be discovered and addressed. Other limiters can be discovered. 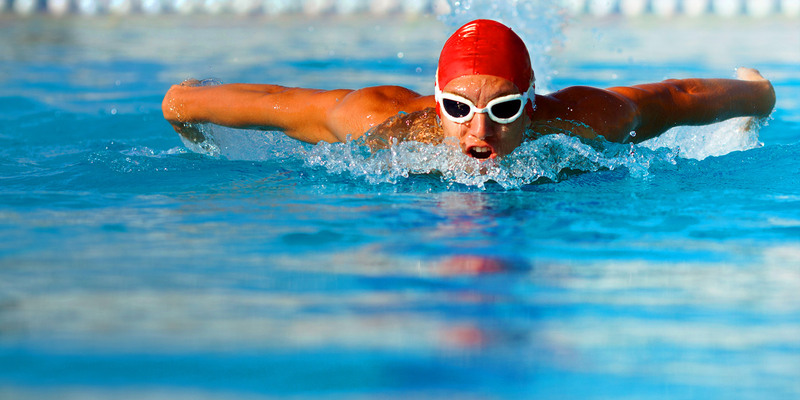 XertTM enables athletes to perform MPA Analysis on activity data. 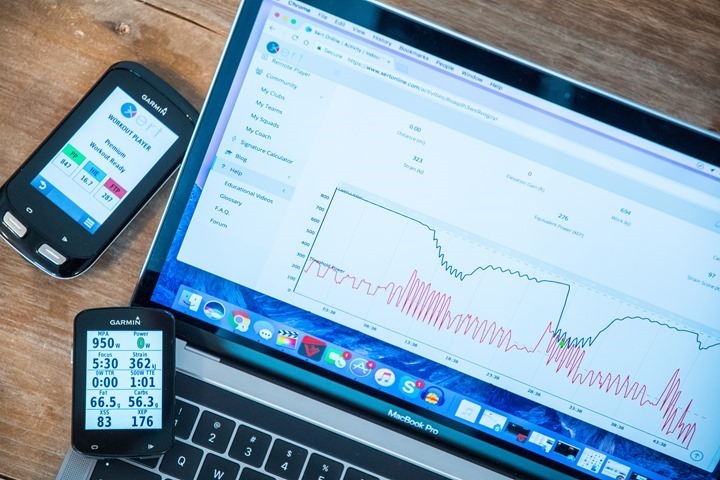 Power data from an uploaded activity file can be analyzed and information about the athlete or the performance can be assessed. An example MPA Analysis from Xert Online is shown below: In this activity, the athlete performed a series of intervals including sprints and short hill climbs. Highlighted on the chart are yellow markers indicating points of maximal effort based on the fitness signature: TP = 315W, HIE = 30kJ and PP = 1210W. As a coach reviewing this analysis, the athlete’s workout was successful as they had intended to reach points-of-failure based on their current signature. Zooming into the area of the activity where the greatest difference between power and MPA was achieved (indicated with green triangles), we can further examine specific occurrences and locations associated with the breakthrough: Using the Extract Signature button, the signature for the activity can be determined: This establishes the athlete’s fitness at the time of the activity. The new signature can be saved to the activity for future reporting or saved to the athlete’s profile such that all future activities will use this signature as their default. In our next blog, we’ll examine how we can train with MPA.